I like about everything there is to like about Learning Group: their intentions, their way of collaborating, the issues they deal with and their methods and strategies. Learning Group is an art group that is comprised of three other art groups (N55 (check out their Land project), Temporary Services and Tercerunquinto; all equally great) and as such they are collaboration to the power of three. They deal with issues such as sustainability, re-use of waste and self-empowerement. 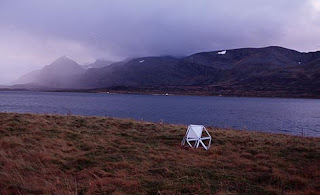 I particularly have a crush on the the project ‘Collecting system’ (pictures above and below) which was carried out during an artists’ residency in Moriya, Japan. After studying the city (what materials and human resources are leftover or unused; what conditions people are living in etc) they decided to work with leftover cardboard. It was used to produce an outdoor cardboard dwelling (picture below) and the construction of a ‘Walking city’ (reminding me of course of the famous walking city project by Archigrams‘ Ron Herron) during a workshop at an elementary school (picture above). The feeling of playfulness on the one hand, and the seriousness and relevance on the other is what makes the project unique. A great combination of intellectual content and joy and improvisation! MSLM: An exhibition and publication or magazine (hopefully the latter) that started off last friday. 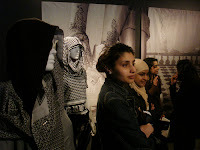 Dealing with fashion for and by Muslim women, the organisation succeeds at emancipation and positive image-building of Muslim women. However, they face a couple of possible pitfalls as well. First of all: at last an exhibition at artists’-run space Mama that is worthwhile and takes up a subject that truly matters. 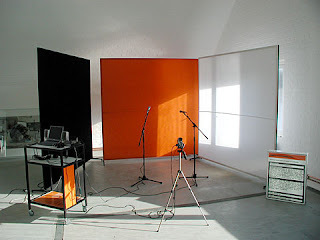 After the gradual departure of its founding members, one of the most unique and innovative art spaces in Rotterdam slowly turned bleach by piling up one pointless exhibition after the other. MSLM takes up Mamas’ former street credibility and sense of momentum and adds a portion of biting political relevance. In the public debate the headscarf that Muslim women wear has turned into a symbol of suppression of women and Islam fundamentalism. 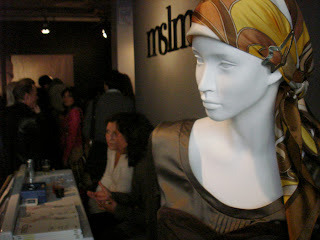 MLSM magazine and the accompanying exhibition strongly and very convincingly create an opposite image: that of a young Muslim woman who is self-confident and self-determined; who self-consciously puts on her headscarf and proudly wears it as both fashion item or accessory, and as signifier of her identity. MSLM proves the headscarf is mysterious, concealing, fashionable, seducing and very female, furthermore, it makes the user stand out as an individual. Nonetheless, the organisers face some complicated issues. Despite the fact that the entire editorial team is comprised of young, female Muslims, the editor-in-chief is Dutch and not Muslim. She deserves all credits for pulling off a fantastic job and putting the issue on the map – the exhibition was on national news, front page news in the largest news papers and as such successful in putting Muslim women positively in the public debate. Nevertheless I wonder if the organisers should have put themselves in another position as such. For instance as initiators and project leaders and rather leave the entire editorship to Muslim women. This is essential, because similar to the freedom of choice of wearing a headscarf, Muslim women should also be entirely in charge themselves in deciding how they are being presented. A final – and necessary – step the organisation needs to take towards complete emancipation. Finally, my favourite piece in the exhibition: a video by Nicole Martens who filmed women one-on-one putting on their headscarfs. She lays focus on the pride and self-consciousness of the act, and puts the person who is putting it on in the center: a free and self-determined individual.